Ultimo CMMS Software - 2019 Pricing, Features and Testimonials. Ultimo’s CMMS Software is a cloud-based computerised maintenance management system used by over 1500 asset-intensive businesses. It is available as a CMMS app, web-based system and also as an on-premise product. The core features of the product include Asset Management, Word Order Management, Contract Management, Planned and Preventative Maintenance, as well as Cost Management. Ultimo’s CMMS App is used by big companies, as well as small and medium businesses. The product is widely used in Energy, Business Services, Care, Education, Environment and Logistics industries. The starting price point for Ultimo’s Cloud-based maintenance system is £230 per month for the first user. Additional users are charged £35 each. Establishes a single “go-to place” for your Maintenance Programs. Provides a common communication tool among your maintenance, production and operation teams. Single maintenance app to manage your equipment and machinery, IT Services, Fleet and Infrastructure Assets. Integrate your CMMS system with ERP, OEE Toolkits, Condition Monitoring, RCM, Manufacturing Execution, and Document Management Systems, together with Engineering & CAD software. Minimises maintenance costs and increases the uptime of your critical assets. Develops an accurate and effective asset register which gives you a concise as well as detailed insight into both your fixed and movable assets. Records details of installations, operations, workflow functions, tools, equipment, machinery, and so on to suit your maintenance program. Records and reports on people, equipment and maintenance. Draws insights from Maintenance History, Planned and Preventative Maintenance Models, P&ID’s, CAD Drawings and Maintenance related documents. Designed to eliminate paper and spreadsheet driven contract management. Records and reports on internal and external contracts. Develops links and insights among contracts, insurance policies, work order management, maintenance programs, inventory management and procurement. Also records and reports on maintenance program terms and notice periods. Designed to reduce reaction time to unplanned equipment maintenance management, and streamline planned maintenance events. Practical and actionable insights into pending work orders and workloads. Develops workflows and statuses of work orders to suit your maintenance programs and organisational terminologies. Audits and reports on costs, hours and materials used during maintenance programs. Plans and schedules work orders using intuitive and graphical Job Planner. Designed to streamline planned and preventative maintenance routines. Supports contemporary maintenance concepts such as Total Productive Maintenance (TPM) and Overall Equipment Effectiveness (OEE). Creates frequency, time or threshold based planned maintenance programs. Workflow links between Planned Maintenance, Work Order Module and Maintenance Contract(s). Assigns Engineers to your planned maintenance program. Audits historical maintenance data and programs with ease. Manages your complex and high cost maintenance programs as projects. Sets up main and sub projects to have complete clarity and control over your maintenance activities. Manages your stock to avoid going ‘Out-of-Stock’ and at the same time avoids ordering stock too early. Requests quotations, places orders, tracks invoices and validates deliveries. Records, reports and takes actionable insights on productive and non-productive maintenance hours. Processes both the productive and non-productive hours of your employees, and finds out which activities occupy the most time at different moments. 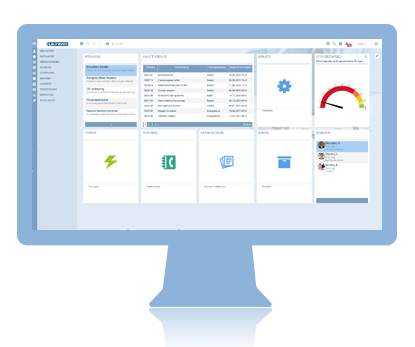 Ultimo’s Computerised Maintenance Management System enables you to easily monitor cost structures at multiple levels within your planned, preventative and Adhoc maintenance activities. Helps you get a comprehensive view of planned costs vs actual costs, and its impact on budget plans. Charge Intra-company and external customers. Easily identify maintenance cost structures and ambiguities. Issue invoices to internal and external customers. Record and report on loaned equipment and machinery. Easily get to know when an equipment is meant to be returned. Quickly identify the user, location and projects associated with leased equipment. If you loan installations and/or equipment to other organizations or staff, this module allows you to keep a tidy record of who possesses what, and when this has to be returned. A graphic planner also gives you an overview at a glance. Easily know the financial value of any asset at any stage of its lifecycle – from procurement to disposal. Use a single set of principal data to manage all aspects of your maintenance plan. Avoid duplication and ambiguity by managing only one set of primary data. Uses Project Management and master data capabilities to schedule multi-year planned and preventative maintenance plans. Uses Cost Registration capabilities to make long term cost optimisation decisions. Take a long term view of your maintenance plan to derive an overall uptime of your operations. Administers physical and digital access to equipment and machinery using key management. Avoids information overload and secures sensitive data by providing access to Ultimo based on maintenance roles. Provides Adhoc incident and situation based access. Records and reports on access based indicators. Set threshold and frequency of notifications by user and user group. This feature is used for proactively informing the relevant user(s) about upcoming maintenance activities, equipment due to be replaced, contract renewals, equipment returns, service plans and other important parameters. On-Premise and Two Types of SaaS/Web-Based/Cloud-Based Deployment. Single maintenance system with multiple modules for managing Facilities, IT, Service, Fleet, Infrastructure and Medical Assets. Can act as either a simple CMMS or complex enterprise asset and maintenance management software. Ultimo’s equipment maintenance software can be configured to moderately manage from complex to highly complex maintenance programs. On-Premise – The product can be deployed on your server. The only trade-off with this option is that product updates may be excluded. SaaS – This is an entry level product which is available as a web-based/Cloud-based system. SaaS Premium – This is a premium offering that provides complete flexibility in configuring/customising your Ultimo. Implementation Methodology: The product is implemented by Ultimo.